Pet frogs don't typically require a lot of medical attention, but sometimes pet frogs develop lumps, bumps, or growths that you can't explain. What may look like a small bump can be a parasitic infestation, a pus-filled abscess, or other serious affliction. Some types of parasites burrow into the skin, and others try to burrow their way out. Tapeworm larvae are one of those types of parasites that seem to burrow their way out. When a frog ingests the egg of a tapeworm (Spirometra or Sparganum spp. ), the egg hatches in the intestinal tract, turns into larvae, and then proceeds to migrate to the skin layer or muscles in a frog. This creates a lump, or growth, on the outside of your frog. This infestation is not only traumatizing to you but also your frog. The growth needs to be seen by your exotics vet to confirm the infestation and to receive treatment. 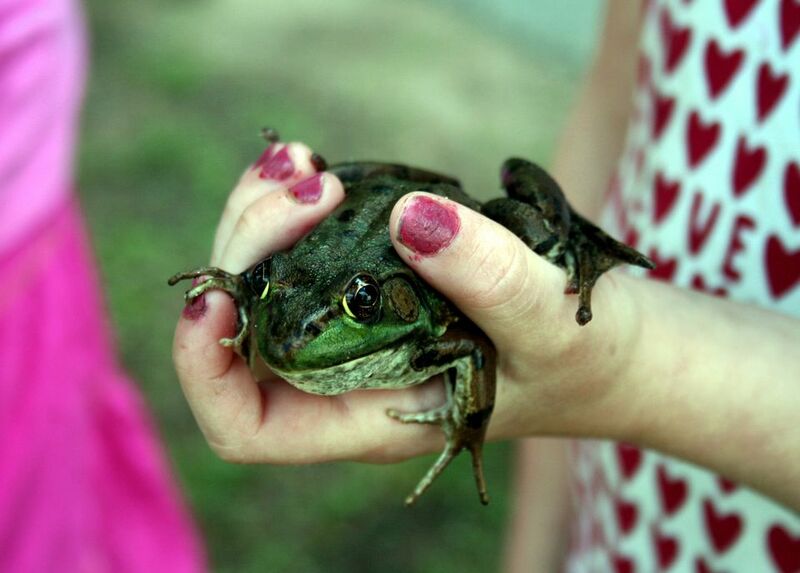 If your frog gets a wound that becomes infected, an abscess may form. An abscess is a pocket filled with pus, which in frogs, is a chunky, white substance. This white substance is a mixture of white blood cells and bacteria and accumulates under the skin. Sometimes an abscess will burst and start draining on its own if enough pus builds up under the skin, but usually, your exotics vet will need to lance the abscess to allow it to drain. The lump of pus may also need to be cleaned out, and your frog may be prescribed antibiotics. Just like other animals, frogs can develop tumors of various types. Both benign and malignant cancers can form along with other kinds of growths. Depending on what kind of tumor it is and the location of the tumor it may or may not cause problems. Some frogs aren't born completely "normal," others get deformed from a traumatic incident, and some will develop abnormally due to nutrition and husbandry problems. Your frog may be able to lead a very normal life if he has a lump that is just a skeletal deformity but other deformities, like on the legs, may affect your frog's quality of life. A cyst is filled with cystic (similar to pus) material but is non-cancerous. It may burst on its own or need to be lanced by your exotics vet. It doesn't bother your frog. Sometimes objects protrude inside your frog that gives it an appearance of a lump and other times a foreign object inside your frog migrates out of the body and forms an actual lump. Regardless, a foreign body requires medical attention. Ingested moss, dirt, sticks, and other foreign objects can cause a large bulge on one side of your frog, giving you the impression that it has lumps. Ingested sharp objects such as pine needles and small sticks can penetrate through the intestines and into the body wall of your frog and create an actual lump. These objects can be easily removed by your exotics vet by creating an incision and pulling the object out, usually without sedation. But if your frog has ingested something he shouldn't have he may require medical attention to help him pass the object. Soaking him in warm water will encourage him to pass it. If your frog has lumps any kind, it is recommended to get it checked by your exotics vet. It may be a simple fix or nothing to worry about at all, or it may be a nasty infection that requires antibiotics.